Increase third party efforts to improve prior art searches and to facilitate a stronger understanding of the world of prior art. Reexaminations should be limitless in time and with no financial harm limitations. Don't streamline. Maintain a variety of options for reexamination requesters. Update information in the USPTO's online Public Patent Application and Information Retrieval (PAIR) databases regularly. Conduct and publish regular evaluations of effectiveness and performance within the Patent Office. Through an examination of the most recent US Patent and Trademark Office (USPTO) reexamination filing data up through December 31, 2007, this report finds that reexamination is an effective process for raising substantial new questions of patentability. Since over ninety percent of all reexamination requests are granted by the Office of the Patent Commissioner, an overwhelming majority of reexamination requests raise substantial new questions of patentability. For ex parte, over three-fourths of the time, these requests narrow or cancel the patent claims in question, showing that the substantial new questions of patentability raised were so strong that the examiners were made to rethink the initial grants. This is even more true for inter partes reexamination, where 64% of all reexamination requests resulted in canceling the claims altogether. This report begins with an explanation of current patent policy in the United States, defines the problem with patent quality and explores the implications for a robust public knowledge commons. The following explanation of current reexamination procedures informs a detailed examination of reexamination filing trends. Finally, the report concludes with a survey of various proposals for patent policy reform and makes three recommendations for improving patent quality for the purpose of expanding and defending the public domain. What is a patent?A patent for an invention is the grant of a property right to an inventor which prevents others from “making, using, offering for sale, or selling” their invention in the United States or “importing” the invention into the United States. This property right lasts for 20 years from the day the patent application was filed. In order to qualify for a patent, the invention must be novel, and non-obvious. Furthermore, one cannot patent mere ideas or suggestions; a patentable invention is limited to a “process, machine, manufacture, or composition of matter, or any new and useful improvement thereof.” Thus, in order to obtain a patent, and one must include a description of the actual machine or subject matter for which the patent is sought (See Title 35 of the United States Code, Section 104). In recent years, the USPTO has come under increasing scrutiny over the quality of its patent examinations.1 The growing push for reform of the patent system is fueled by the rapid rise of technology, financial services, telecommunications, and other innovations driving the information economy, all straining the USPTO's ability to evaluate and issue quality patents.2 Problems with patent quality occur when the Patent Office grants patents on claims that are broader than what is merited by the invention and the prior art.3 In fact, a number of these problematic patents have been issued and publicized to much fanfare, including the infamous Smuckers' peanut butter and jelly patent where the company asserted a patent on their method of making the UncrustiblesTM crust-less peanut butter and jelly sandwiches, among others.4 These “bad” or improvidently granted patents impact the USPTO's ability to promote overall patent quality which, I will show, has serious implications for the public domain. The patent system is furthermore shaped by ideas about international competition and US ability to stay competitive with foreign technology. By encouraging innovation through intellectual property regulation, patents can help the US be technologically competitive in the international economy. Why worry about a bad patent? Opportunistic licensing royalties and fees. Licensors may rationally settle for a license instead of resorting to protracted litigation. Competitors must waste time designing around dubious patents. The cost of rent-seekers who may choose to invest in start-up companies based on bad patents, thereby taking away resources from genuine entrepreneurs. The social cost of supra-competitive pricing, in the absence of noninfringing product substitutes. The filing and prosecution costs and the subsequent cost of having the courts fix the USPTOs oversights. In light of these high social costs and economic inefficiencies, this paper addresses the policy problem that there are too many improvidently granted “bad patents” that, in light of new prior art, do not meet the novelty or nonobviousness requirements for patentability. One way of ensuring patent quality is by increasing standards and controls in the patent application process. Another avenue to increase patent quality is after the patent has been issued through the process of reexamination. 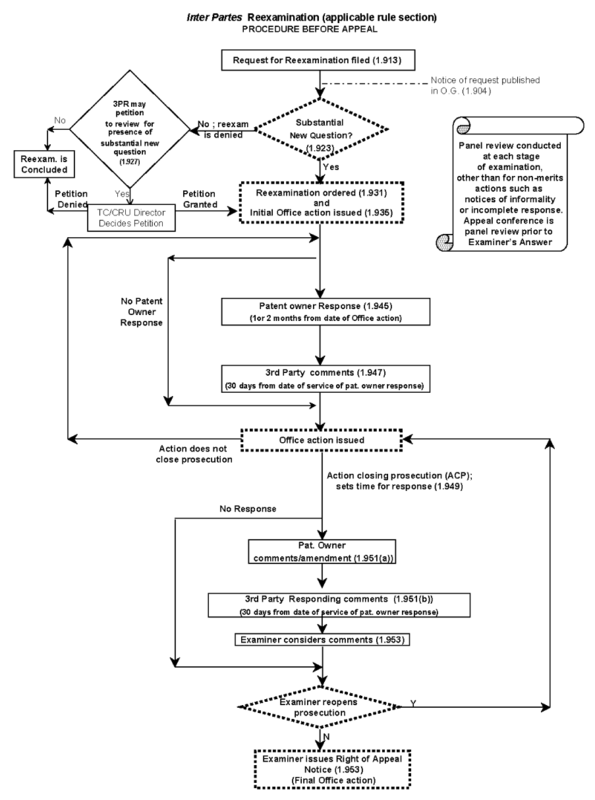 Through an evaluation of this process, this paper addresses the question of how effective reexamination is in addressing improvidently granted “bad” patents and increasing patent quality and proposes several policy recommendations addressing reexamination effectiveness. What is reexamination?The basic process of reexamination begins with a request submitted to the Office of the Patent Commissioner by a third party, another inventor, or by the office itself. Subsequently, one of two things happens to this request. If the Patent Commissioner finds no valid case for reexamination and the request has not raised a substantial new question of patentability, the request is denied. If the Patent Commissioner has found the request has raised a substantial new question of patentability, the request is granted. To supply the public with an efficient means to contest the validity of problem patents that may have been issued improperly, Congress created the process of reexamination.16 Through reexamination, a patent can be brought under scrutiny in an internal office proceeding after the patent has already been issued. Essentially, reexamination is a vehicle for the USPTO to consider substantial new questions of patentability concerning the claims of an existing patent. 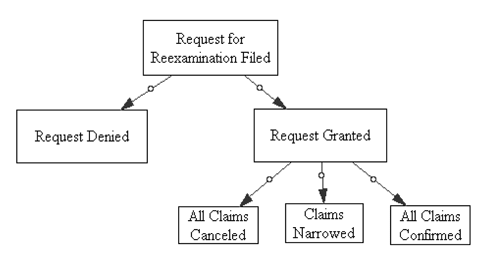 As an internal office proceeding, reexamination can also help resolve patent disputes before the dispute reaches costly litigation. Once a reexamination request has been granted, a patent examiner reexamines the patent in light of the substantial new questions of patentability raised in the form of a prior patent, prior art, or printed publication. Ultimately, the examiner then issues a Reexamination Certificate20 with one of three conclusions: all claims are affirmed, all claims are canceled, or claims are narrowed. What is ex parte reexamination?In ex parte reexamination, the party who submitted the reexamination request may no longer actively participate in the proceedings. The correspondence is strictly between the examiner and the patent owner. In inter partes reexamination, the requesting party may continue to participate in the proceedings. Both processes however, do not differ as to the substance to be considered in the proceeding. 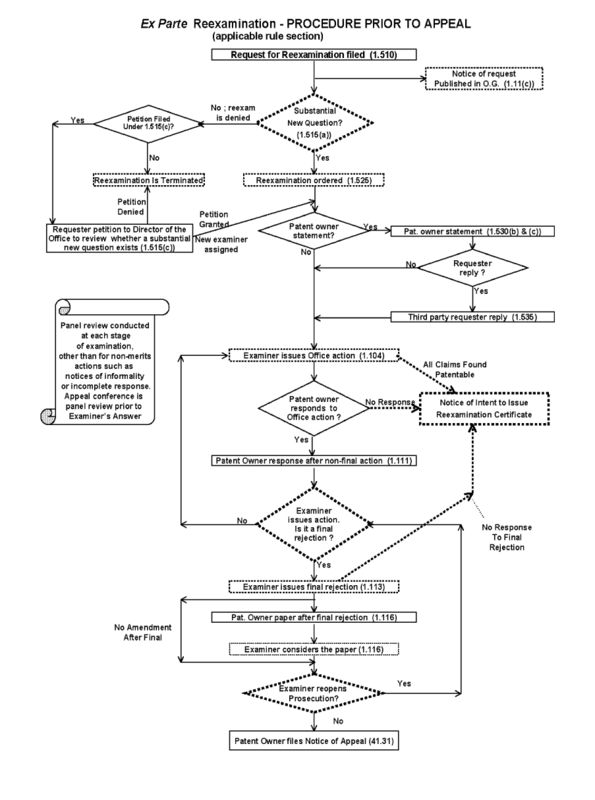 Ex parte and inter partes reexamination procedures present different options for a requester, depending on factors ranging from budget and time constraints to technical complexity and the size of the potential prior art arsenal.22 In ex parte reexamination, the lopsided representation in the process can create a procedural edge for the patent owner, who enjoys an exclusive dialog with the examiner once the reexamination is underway. Indeed, this factor is often cited by third parties who choose not to pursue ex parte reexamination, which effectively requires the requester to provide as much ammunition to the examiner as possible in the initial submission.23 Also, patent owners themselves may file ex parte reexamination requests on their own patents to narrow claims that may have been overly broad. What is inter partes reexamination?Inter partes was created by Congress through the passage of the American Inventors Protection Act of 1999 to increase the attractiveness of reexamination over the costly alternative of district court litigation. Inter partes reexamination is only available for patents that were filed on or after the bill was passed on November 29, 1999. By allowing full participation by both the patent holder and the third party requester, inter partes allows the examiner to act more like an arbiter, taking advantage of the adversarial process. Another consideration for filers is the estoppel provision which precludes third parties from raising, in litigation, issues that could have been raised during the course of the inter partes reexamination proceeding.24 The estoppel provision was enacted to protect small companies and individuals against attacks by larger entities with more resources. The theory was that a corporation could first try to invalidate the patent under reexamination, and subsequently, if that were to fail, use their extensive resources to raise the same issues in litigation. The estoppel provision, while acting as an appropriate protective measure also makes the inter partes option much less attractive for many parties. It is important to note that the motivations behind a reexamination request may be a factor in the ability to judge the fairness and effectiveness of the reexamination process. For example, it is difficult to judge just how many patents brought up for reexamination were improvidently granted. It is possible that economic incentives, rather than a concern with the dubiousness of a patent, may more often motivate a party to request a reexamination.. Thus, the ability to make definitive statements about the effectiveness of reexamination is bound by how many “bad patents” are not getting reexamined and how many “legitimate patents” are being reexamined unfairly. The latter may be estimated by the number of patents that come out of reexamination with no claim changes, but this is not necessarily an accurate assumption as it would not take into account improvidently granted patent that come out of reexaminations unscathed. 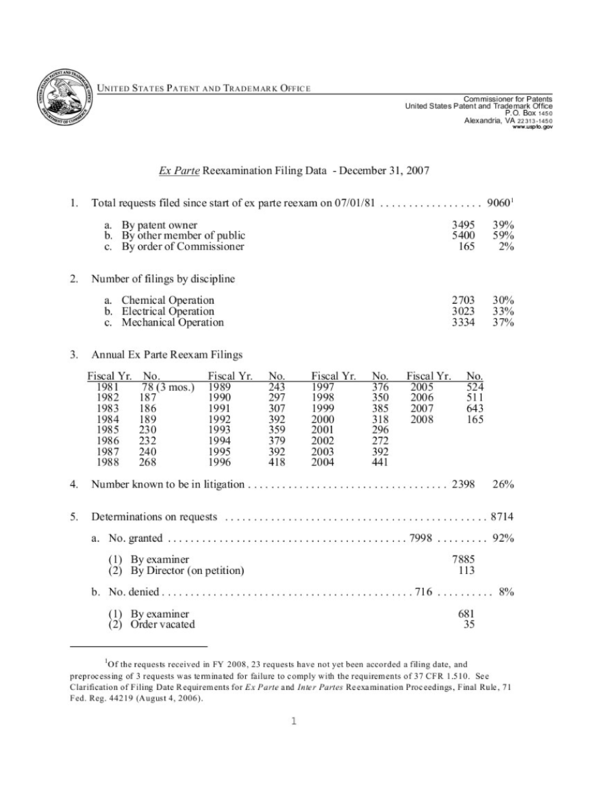 This most recent filing data covers all ex parte reexamination proceedings since the start of ex parte reexamination on July 1st, 1981 up through December 31, 2007.29 According to the most recent filing data, ex parte reexamination is capable of consistently raising substantial new questions of patentability and also seems to be a fair and effective way of improving patent quality through its ability to narrow patent claims. Within this time period, there have been over nine thousand requests, averaging over five hundred annually in recent years. Of these requests, the Office of the Commissioner for Patents has granted over ninety percent, finding that the requests raise a substantial new question of patentability. The high request grant rates reveal that ex parte reexaminations tend to raise important new questions of patentability. 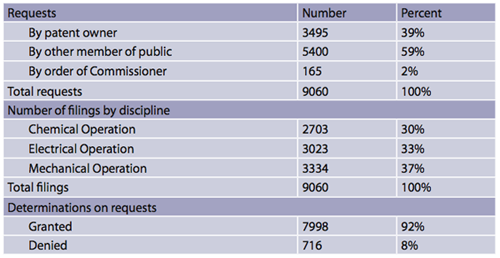 The following table shows how many requests were filed by patent owners and third parties, in what disciplines, and how many of those requests were granted. By finding a substantial new question of patentability in ninety-two percent of reexamination requests, the Office of the Patent Commissioner recognizes the ability of ex parte reexamination proceedings to provide the PTO with important relevant information. Furthermore, the large number of claim changes as a result of these requests reveal that reexamination is an important cornerstone of the Patent Office's capacity to ensure good patent quality. Out of the ninety-two percent of reexamination requests that are granted, 3 out of 4 requests have a substantial effect on the claims. 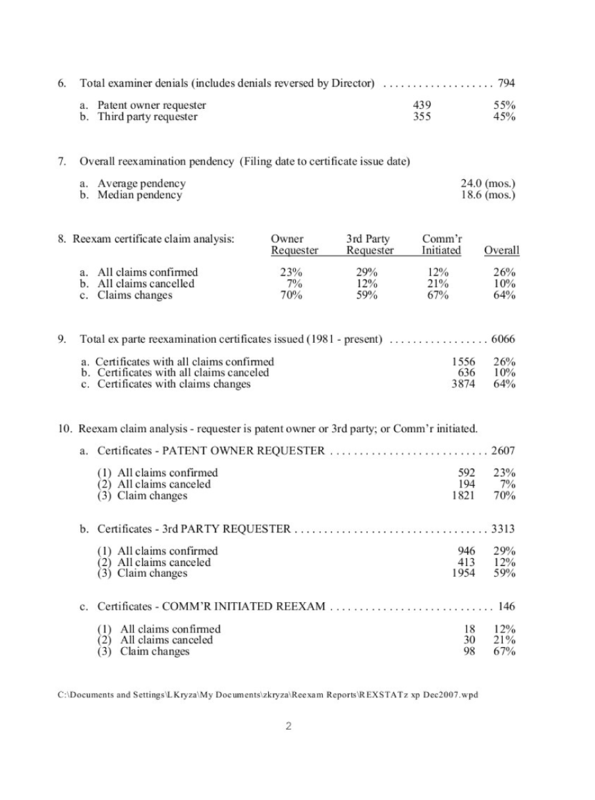 This is calculated from the figures below that reveal in ex parte reexamination, sixty-four percent of patents have their claims narrowed and ten percent of patents have all their claims canceled since a patent's claims may not be broadened in ex parte reexamination. Whether filed by a third party or the patent owner themselves, the latest reexamination filing data shows that ex parte reexamination is a tool that is capable of decreasing the scope of “bad” patents and minimizing their impacts on the public domain. With the PTO able to substantially rework many of the patents in light of the substantial new questions of patentability raised in ex parte reexamination, these proceedings are an important avenue that must be kept open for the PTO to continue to ensure patent quality. According to the data, inter partes reexamination is also a fair and effective proceeding that allows third party requesters to challenge improvidently granted patents and raise valid new questions of patentability. Requests for inter partes reexamination are granted at incredibly high rates. This may be due to some amount of self-selection that limits inter partes filings to those requesters sufficiently confident in their arguments to risk estoppel.32 The following table shows how only four percent of all inter partes requests have been denied since the start of inter partes reexamination proceedings in 1999. Furthermore, inter partes reexamination results in a comparatively large number of claim cancellations for requesters as shown below. This may be due to the adversarial process utilized in inter partes where the requester presents their best arguments to the issues raised by the patent holder. There are significantly fewer inter partes filings than there are ex parte. Since the start of the inter partes reexamination procedure, there have been three hundred fifty-three inter partes reexamination requests filed, representing only four percent of all ex parte reexamination requests filed. However, the total number of ex parte reexamination requests includes requests filed since the start of ex parte reexamination proceedings in 1981, so ex parte reexamination also has had an eighteen year head start. The following chart shows how the number of both ex parte and inter partes requests has been rising in recent years. 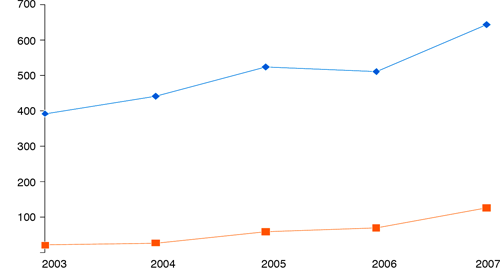 In the last five years, the number of inter partes requests has nearly doubled from 2006 to 2007 and increased by twenty percent from 2005 to 2006. It may not be reasonable to compare the number of requests filed however, since as noted earlier, whether a party chooses to file an ex parte request or an inter partes request depends heavily on the party's circumstances.34 This is apparent when examining the large differences in the impact on the patent claims. For third-party requesters, for example, an inter partes proceeding is fifty percent less likely to result in the confirmation of all claims and over seven times more likely to result in the cancellation of all claims. While ex parte reexaminations are more likely to result in a narrowing of the patent claims, inter partes reexaminations are more likely to result in a cancellation of all claims as shown in the following table. The two procedures are used by different parties for different purposes. For example, while third party filers can utilize either reexamination procedure, patent holders may only use ex parte to reexamine their own patent. As mentioned earlier, patent holders filed forty-one percent of ex parte reexamination requests, seeking to amend their patent or test their patent against certain prior art. The following table compares the results to claims of reexaminations requested by third parties and reexaminations requested by patent owners. From these figures, the high rates of reexaminations resulting in all claims confirmed for patent owner requesters may be raising the overall ex parte rates of claim confirmation. It is clear that both kinds of reexamination processes have the capacity to contribute to improved patent quality and minimize the impact on the public domain. By allowing patent holders to test and revise their own claims and by allowing concerned third party requesters to challenge problematic patents, reexaminations provide an avenue outside of litigation to address dubious patents. How effective these proceedings are in their ability to holistically address the policy problem of improvidently granted patents remains to be seen. There are different ways of promoting fairness in the patent system throughout the stages of patent issuance. Increasing the level of prior art review for patent applications is one avenue of increasing patent quality before a patent is issued. Once a patent is issued, a reexamination request can be used to improve patent quality upon second review. Finally, legislative reform can introduce broad comprehensive policies for improving the patent system. In the initial examination process, improvements can be promoted through evaluating prior art more thoroughly. The Peer to Patent project addresses the problem of patent quality by enabling the public to submit prior art and commentary relevant to the claims of pending patent applications in the fields of computer architecture, software, and information security.36 Before the patent is issued, the Peer to Patent Project solicits prior art contributions and allows users to upload prior art that is relevant to the patent application's claims. Once evaluated, they send the top ten prior art references to the USPTO for review. The Peer to Patent Project has even secured an agreement with the USPTO to expedite applications that participate in the Peer to Patent Project to the front of the queue. By collaborating with the USPTO, the Peer to Patent Project ensures that relevant prior art is evaluated and taken into account in the patent application process. The Electronic Frontier Foundation's Patent Busting Project, established in 2004, identified its "Ten Most Wanted" patents for "crimes against the public domain,"39 and has initiated reexamination requests for five of them to date, which have all been granted. Requests have included challenges to Clear Channel's patent concerning the digital recording of live performances, Test.com's patent concerning Internet test-taking, and the most recent Sheldon gaming patent concerning online gaming technology. Fairness in the patent system can also be promoted administratively. There are various policy mechanisms within the USPTO introduced and revised to encourage fairness in reexamination proceedings. 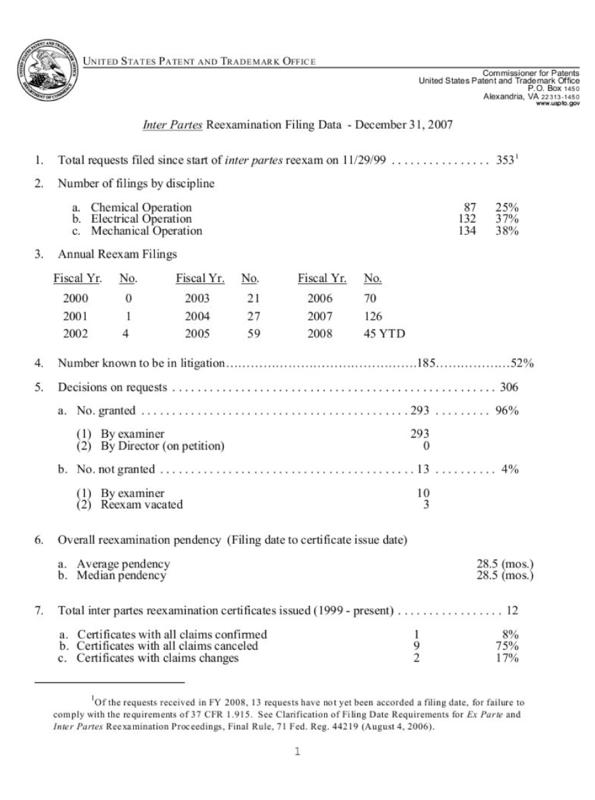 All patent examining policies are cataloged in the Manual of Patent Examining Procedure (MPEP).40 One major policy change to USPTO reexamination procedures was the 1237 OG notice that specified that the examiner assigned for ex parte reexamination proceedings must be different from the examiner initially assigned to issu the patent.41 This policy change was meant to increase fairness in the proceedings by eliminating any potential bias in the examiner's decision. In addition to these various mechanisms for promoting reform, ultimately we need proper legislation to ensure fairness in the patent system. Following a recent threat to reexamination proceedings in the Patent Reform Act of 2007, S.1145, concerns about how to improve patent quality continue to abound. The Act which would have practically eliminated third-party post-grant review, raising concerns about the ability of the USPTO to continue to ensure good patent quality. While the Senate reform bill strove to introduce some significant positive reforms for the patent system by allowing more information to be presented to patent examiners and seeking to tie damages awarded in infringement cases more closely to the innovation represented by the patent, it also posed a serious threat to the post-grant review. This revision would only permit third parties to question the validity of issued patents within twelve months of issuance, severely restricting the ability of public interest groups to voice their concerns over dubious looking patents. Although the bill passed in the U.S. House of Representatives in 2007, its passage in the Senate has since been controversial. As of April 2008, the bill has stalled in the Senate over some key issues. Democratic Senator Patrick Leahy said negotiations were close to complete but halted by “just a handful of words,”.47 The primary sticking point for legislators and key stakeholders was the issue of how damages for infringement should be calculated. Although the current bill has stalled, it is widely accepted that the issue of patent reform in the U.S. Congress will continue be an ongoing issue that will surface again in the near future.48 However, the difficulty Congress faces in passing a strong, comprehensive patent reform bill will continue to be compounded by the pressing need for reform in the many organizational sectors of the patent system, the strength of the political lobby, and the rapidly growing tech industry. Defining appropriate recommendations for improving patent quality depends how the origins of the problem are defined. Do we strengthen enforcement and penalties for infringement, increase standards for patentability, redefine what qualifies as patentable material? And what is the appropriate combination of approaches? As previously discussed, there are different approaches to why patents are issued improperly and different concerns with the effects of such bad policy. One possible solution to the problems relating to patent quality lie within the reexamination process. These policy recommendations were developed in light of the detrimental effects improvidently granted patents have on public knowledge and the public domain. The following recommendations prioritize this consideration and emphasize approaches to increasing patent quality that minimize the impact of improvidently granted patents on the public domain. There is obvious potential to strengthen patent quality by reducing the number of “bad” patents that are issued. Public interest groups in particular can have a distinct role to play in improving patent quality. Independently funded public interest efforts lack political ties and obligations and are thus appropriately positioned to propose avenues for addressing threats to the public domain. Some public interest efforts are already underway, striving to carve out and protect public knowledge by strengthening and improving the level of review of patent applications. In the application process, the Peer to Patent Project strives to address problems with patent quality by strengthening their standards of review with the help of online contributers. This publicly contributed knowledge can help expand the world of prior art, particularly in the information industries, and decrease the number of “bad” patents that emerge from the patent application process in the first place. Support third parties organizational ability to conduct reexaminations of dubious looking patents. As I have shown, reexamination is an important tool capable of improving patent quality for patent holders themselves as well as for third party public interest filers. Third party public interest filers can play an important role in improving patent quality as their efforts are explicitly concerned with the effects of dubious looking patents on the public domain. As I have shown, public interest groups are often utilizing reexamination proceedings in order to challenge patents that come dangerously close to impeding public knowledge. Maintain the ability for third parties to file reexaminations within an unlimited period without the requirement to prove direct financial harm. One argument against third party post-grant review is that it places too much burden on overworked patent examiners. However, the Patent Office grants an overwhelming majority of reexamination requests by third parties, as I have shown, welcoming the ability of these requests to raise substantial new questions of patentability. By denying third party public interest filers the procedural ability to challenge patents, the patent system would sacrifice an important asset and a mainstay of their mission to manage the public domain and promote public knowledge and innovation. The recently avoided risks posed by the Patent Reform Act of 2007 posed a direct threat to the ability of reexaminations to promote fairness in the patent system with the proposed filing limitations. Although it has been taken off the table for now, we must maintain the procedural ability of third parties to conduct reexaminations on behalf of the public interest. Additionally, we need a grab bag of options for post-grant reexamination proceedings in order to be most effective and efficient. Since requesters file different kinds of reexaminations for different reasons, we must maintain a variety of options in the post grant period to ensure appropriate procedures for different filers. Inter partes and ex parte reexamination are only two of the current ways to improve patent quality once a patent has been issued. If the same procedure applied for different filers, some filers may pay too much, wait too long, etc.. and these limited options for reexamination requesters would increase inefficiency of the Patent Office. A more efficient system would be able to direct patent examiners to look at specific requests and also be able to formulate those requests appropriately. A variety of options will also be helped by recommendation number two that helps direct the requester to the relevant prior art. Lastly, this final recommendation would help us accomplish the first two recommendations more effectively. Making information about patent prior art more accessible would aid in organized efforts both before a patent is issued as well as after. The Prior Art Project49 aims to facilitate better prior art search by introducing a standard prior art tag and a central wiki-style user-generated database of public knowledge. User generated content pertaining to the software reference is tagged appropriately so internal processes, modules, and structures can correspond with patent claim elements. The project can also help define the realm of patentable material and allow any interested parties to find invalidating prior art software, as the database grows. Public interest projects such as these are well-situated to propose policy changes to the patent system because they are not being beholden to slow, bureaucratic government processes or political influence. Increasing this kind of public participation, particularly utilizing Web 2.0 tools to gather and disseminate information, allows these players to continue to explore policy solutions outside of slower legislative reform efforts. While all information regarding patent reexamination proceedings is publicly available, the USPTO public PAIR database is unwieldy and organized so that file proceedings are still difficult to access. The PAIR service does not allow a user to browse the archive on their own terms, for example, by listing all of the reexaminations in one year or all the reexaminations that resulted in a certain way. Most significantly, the file information contained in PAIR is still very incomplete. Improvements to this system would greatly improve knowledge about the world of patented prior art. The emergence of Google Patents is an indication of the opportunity for the growth of public knowledge about patents. The USPTO should also take advantage of this opportunity by increasing the online availability of file and regularly updating their public records. The reexamination process is capable of revising individual patents, but it is not designed to be a procedural or systematic check. With limitations on the ability to search for prior art, particularly in software and technology patents, reexaminations are difficult to conduct on a wide scale. Since public interest groups are often poorly resourced, we must consider the effectiveness of this process in redressing improvidently granted patents. As a comprehensive policy solution, it is unreasonable to expect reexaminations alone to be enough, particularly since we still don't even know how many “bad” patents there currently are in existence. In addition to more research, we also need political consensus around how we formulate the problem to begin to pursue viable legislative change. These recommendations are just partial suggestions for addressing the larger systemic problems with the US patent system and should be seen as only steps in the right direction. Before a patent is issued, increasing third party efforts continues to prove useful to the office as seen through the Peer to Patent Project's work. Combined with appropriate internal reexamination mechanisms after issuance to catch patents with prior art that has been overlooked, public interest efforts can play a pivotal role in improving the patent system. EFF's Patent Busting Project does this by raising substantial new questions of patentability via reexamination. Increasing public interest participation in addressing problems with patent quality would allow these players to continue exploring policy options without resorting to litigation or embarking on lengthy legislative reform efforts. In this way, these independent efforts may be the key to exploring new avenues for addressing the problems improvidently granted patents pose to maintaining a vibrant public domain. 1. John R. Allison and Mark A. Lemley, “The Growing Complexity of the United States Patent System”, B.U.L. Rev. Vol. 82. 2002: 77. Kevin M. Baird, “Business Method Patents: Chaos at the USPTO or Business as Usual?”, J.L. Technology and Policy. 2001: 347. Rebecca S. Eisenberg, “Obvious to Whom? Evaluating Inventions from the Perspective of PHOSITA”, 19 Berkeley Technology Law Journal. 2004: 885. Arti K. Rai, “Allocating Power over Fact-Finding in the Patent System”, Berkeley Tech L.J. Vol. 19. 2004: 907. 2. Viet Dinh and William Paxton. “Patent Reform: Protecting Property Rigths and the Marketplace of Ideas”. White Paper. Coalition for Patent Fairness. 3 December 2007: 2. 3. Jay Kesan. Carrots and Sticks to Create a Better Patent System, 17 Berkeley Technology Law Journal. (2002): 763. 4. Sara Schaefer Muñoz. “Patent No. 6,004,596: Peanut Butter and Jelly Sandwich” Wall Street Journal. 5 April 2005. <http://online.wsj.com/article/SB111266108673297874.html>. 5. Mark Lemley, Peter Mennell and Pamela Samuelson. Software and Internet Law. Aspen Law & Business Publishers. 2001. 6. Article 1, Section 8. The United States Constitution. <http://www.house.gov/house/Constitution/Constitution.html>. 7. Functions of the United States Patent and Trademark Office. General Information Concerning Patents. United States Patent and Trademark Office. Revised January 2005. <http://www.uspto.gov/web/offices/pac/doc/general/index.html>. Accessed April 2008. 8. Viet Dinh and William Paxton. “Patent Reform: Protecting Property Rights and the Marketplace of Ideas”. White Paper. Coalition for Patent Fairness. 3 December 2007: 2. 10. Cohen finds that for software patents, prior art is found outside the areas in which the Patent Office traditionally conducts searches. Julie Cohen. “Reverse Engineering and the Rise of Electronic Vigilantism: Intellectual Property Implications of “Lock-Out” Programs”. Southern California Law Review. Vol. 68. 1995: 1091-1178. 11. Davis explains the political determinants of the U.S. patent system characteristics. Michael Davis. “Patent Politics”. S.C. Law Review. Vol 56. 2004: 227. 12. The USPTO bears no responsibility for allowing an invalid patent to issue. Courts do not fine the USPTO upon invalidating a patent; the examiners who allowed the case are not discipined for their oversight; nor must the USPTO award damages to affected members of the publicto compensate for an improvidently granted patent. The costs of failing to acquire information are simply shifted to other actors- in particular, the federal courts, the patentee’s competitors, and ultimately, consumers. John R. Thomas. 25 “The Responsibility of the Rulemaker: Comparative Approaches to Patent Administration Reform”. Berkeley Technology Law Journal. Vol 17. 2004: 733. 13. It is evident that examination of patent applications by the PTO is significantly less rigorous than is the examination of patent applications by the EPO (European Patent Office), the JPO (Japanese Patent Office), or the GPO (German Patent Office). Also, the likelihood of ultimately obtaining allowance of a patent application from the PTO is far greater than in the EPO, the JPO, or the GPO. C.D. Quillen Jr. and O.H. Webster, “Continuing patent applications and performance of the US Patent Office”, Federal Circuit Bar Journal Vol. 11, 2001: 13. 14. Ashley Parker. “Comment: Problem Patents: Is Reexamination Truly a Viable Alternative to Litigation?”. North Carolina Journal of Law and Technology. Vol 3. Spring 2002: 306. 15. Shubha Ghosh and Jay Kesan. “What Do Patents Purchase? In Search of Optimal Ignorance in the Patent Office”. Houston Law Review. Vol 40. 2004: 1219. 16. Sec 301-307, 35 United States Code; Sec 311-318, 35 United States Code. 17. Steven Baughman. “Reexamining Reexaminations: A Fresh Look at the Ex parte and Inter partes Mechanisms for Reviewing Issued Patents”. Journal of the Patent and Trademark Office Society. Vol. 89. May 2007: 363. 18. A substantial new question of patentability is defined in the statute as one that is “substantially different from those raised in the previous examination of the patent before the Office”. MPEP Sections 2216, 2616; Sec 304 and 312. 35 United States Code. 19. Sec 2244, 2644. MPEP 301. 35 United States Code. as cited by Baughman, Steven. “Reexamining Reexaminations: A Fresh Look at the Ex parte and Inter partes Mechanisms for Reviewing Issued Patents”. Journal of the Patent and Trademark Office Society. Vol. 89. May 2007: 349. 20. See Appendix B: Sample Reexamination Certificate. 21. Chad Walters. Baker Botts. Boalt Presentation 2008. 24. A third-party requester whose request for an inter partes reexamination results in an order ... is estopped from asserting at a later time, in any civil action arising in whole or in part under section 1338 of title 28, United States Code, the invalidity of any claim finally determined to be valid and patentable on any ground which the third-party requester raised or could have raised during the inter partes reexamination proceedings. Sec 315(c). § 2685. Manual of Patent Examination Procedure. 25. Based on USPTO data through July 1, 2005, 67of the 86 orders granting reexamination were issued with a first office action. Joseph Cohen. “What’s Really Happening in Inter Partes Reexamination”. Journal of Pat. & Trademark Office Society. Vol 87. March 2005: 207. 27. (d) All papers or copies thereof relating to a reexamination proceeding which have been entered of record in the patent or reexamination file are open to inspection by the general public, and copies may be furnished upon paying the fee therefore. Sec 103. Manual of Patent Examining Procedure. 8th edition. September 2007. 28. For the original documents provided from the USPTO, see Appendix D and Appendix E. Ex Parte and Inter Partes Reexamination Filing Data. United States Patent and Trademark Office. provided on February 22, 2008. 30. a. b. c. Ibid. 31. “Claims in Proceeding Must Not Enlarge Scope of the Claims of the Patent”. Sec. 2258(b) Manual of Patent Examining Procedure. 8th edition. September 2007. 32. a. b. Baughman. 361. 35. a. b. Data from Appendix D: Ex Parte Reexamination Filing Data: 1981-2007 and Appendix E: Inter Partes Reexamination Filing Data: 1981-2007. 37. Statement of the Executive Director of Public Patent Foundation 109th Cong. “The Patent Act of 2005: Hearing Before the Subcommittee On Courts, The Internet, and Intellectual Property”. June 9, 2005. 39. Electronic Frontier Foundation. <http://eff.org/patent>. 40. The 8th edition, revision 5 is dated September 2007 and can be found online at <http://www.uspto.gov/web/offices/pac/mpep>. 42. Paul Morgan and Bruce Stoner. “Reexamination vs. Litigation — Making Intelligent Decisions in Challenging Patent Validity”. Journal of Patent and Trademark. Vol. 86. 2004. 450. 43. Draft Judiciary Committee Report of the Patent Reform Act of 2007. 44. Footnote 87, Draft Judiciary Committee Report of the Patent Reform Act of 2007. 45. The Patent Busting Project. The Electronic Frontier Foundation. <http://www.eff.org/patent>. 46. Emily Berger. “EFF asks U.S. Senate to Protect Reexam Proceedings”. EFF Deeplinks Blog. <http://www.eff.org/deeplinks/2008/02/eff-asks-u-s-senate-protect-reexamination-proceedings-and-patent-busting-project>. 48. John Eastman. “The Patent Reform Act of 2007 — Part Two: Comments and Interviews from Stakeholders” 21 April 2008. Black and White Program. <http://www.blackandwhiteprogram.com/report/patent-reform-act-of-2007-part-2>. 49. Prior Art Project. <http://wiki.mozilla.org/Legal:Prior_Art>. 50. Sec 2201. Manual of Patent Examining Procedure. Title 35, United States Code. 51. Sec 2601.01. Manual of Patent Examining Procedure. Title 35, United States Code.